Recently, RFcnn.com, a renowned manufacturer of all kinds of RF connectors, has announced its newest promotion of SMB connectors. Recently, RFcnn.com, a renowned manufacturer of all kinds of RF connectors, has announced its newest promotion of SMB connectors; all its SMB connectors are now provided with big discounts. The special offer will be valid until Oct. 16, 2013. In the promotion, RFcnn.com ensures that all its customers around the world will receive quality SMB connectors at a cost they can afford. These SMB connectors are said to offer excellent electrical performance from DC to 4 GHz. “Our service and support team is led by technical experts who have proven success in the past. Our quality products and services will bring us many customers in the long term. Our SMB connectors are specially designed for the high end clients in the international market; these customers put much emphasis on product quality,” says the marketing director of the company. An SMB connector is a coaxial RF connector, and it is smaller than an SMA connector. Many customers of RFcnn.com have high confidence in the quality, reliability and competitiveness of RFcnn.com’s products and services. In addition, RFcnn.com owns many product patents, which demonstrates that it is a responsible business. The company is famous in the industry for its expertise in the manufacturing industry; it has the ability to provide all kinds of connectors in a big quantity. Quality control is very strict here. The company is willing to accept OEM orders to satisfy various requirements from different customers. 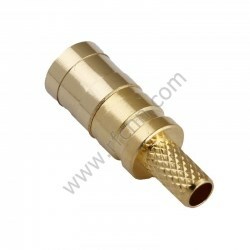 More details can be found at http://www.rfcnn.com/SMB-Male-Right-Angle-for-PCB-RF-Connector-165.html.